Office partitions provide a flexible and convenient way of utilising your available space, separating areas out without the need for permanent walls and allowing for a changeable floor plan. Here at Stodec Products, we stock an extensive range of premium office partitioning options that are simple to assemble, install and adapt. Our selection includes economical 50mm composite partitioning and attractive glass system partitioning and our experienced team are on hand to supply and install all partitions tailored to the exact needs of your office. For more information about our office partition solutions, get in touch with Stodec Products today. We can include a very wide range of wall finishes & advise on sound rating, fire rating, & building regulations requirements. 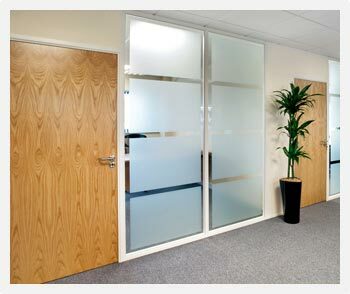 Installations can include different types of partitions for Executive, Office, or Meeting room areas. Storage walls & moving wall systems can be included.